The blue surgeonfish starts its life almost entirely yellow. Little by little the intense blue colour spreads from the front of the body to the tail as the fish becomes adult. The tail, which remains yellow, has a couple of sharp needles the fish uses to defend itself, the so-called scalpels, and this is why they are called surgeonfish. 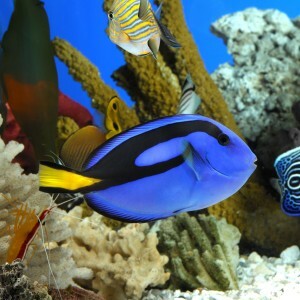 Its body is oval and compressed on the side, and the surgeonfish has a small mouth with a single row of teeth. The blue surgeonfish is a gregarious animal that forms small groups. It feeds on zooplankton, although it might also eat some benthonic seaweed. Adult individuals usually form small groups near the areas of the currents to be able to catch food. They are oviparous animals and when the time comes to reproduce they gather in small groups formed by a male and several females. At this time the females can be distinguished as the bands on their body become grey. They live on coral reefs. They are in the Indian-Pacific, and live from Western Africa to the Central American coasts. Do you know why they are called ‘pez cirujano paleta’ in Spanish? Because the black bands on their bodies draw a silhouette that reminds us of a painter’s palette.